It’s been just over a week since my debut novel, FAST FORWARD, was released, and what an amazing week it’s been! It feels great to have a story out there, and even greater having had such great feedback from it so far! A BIG thank you to those who’ve bought it, reviewed it, told their friends about it, and messaged me to say how much they’ve enjoyed it. It really means a lot. At the ARRA blog I share the blurb for Fast Forward and tell you a bit about my inspiration. At Rachael Johns’ blog I talk about The Creative Curse, and share photos of celebrity drawings I did when I was a teenager. At Strange Candy Reviews I share how I went from idea to publishing contract in nine months. At the RWA blog I’m being interviewed under the Author Spotlight and sharing a brief excerpt. At Mochas, Mysteries, & More I’m sharing an excerpt involving a dangerous piece of support underwear! At Read in a Single Sitting, Stephanie Campisi wrote up a fantastic feature article based on my interview which is all about The Art of the Do-Over Novel. I also discuss why I opted for digital publication. At You Gotta Read I talk about why I’ve Gotta Write, and also share my writing process. And at Manga Maniac Cafe I’m being asked some interesting interview questions such as how I came up with the idea and the characters, what my character’s theme song would be, and what book turned me onto reading. On Monday 11th Feb I’ll be at Romance Book Paradise discussing time travel in romance, so keep an eye out for that one! Also, you could win a bonus $25 gift card when you purchase Fast Forward by forwarding your receipt to fastforwardbook(at)gmail(dot)com ! Something has been brewing at the Escape Publishing headquarters. An idea has surfaced, thanks to innovative Ainslie Paton and the backing of the wonderful Escape team. The Escape authors, or Escape Artists as we are known, are going on an Escapade! No we’re not jetting off around the world for an adventurous holiday or African safari (although, there’s an idea), our Escapade is taking place right on the Escape blog. That’s right, 30 Escape authors are going to join forces to write one short story over one month, with each author’s contribution being posted daily on the Escape blog from Feb 14th onwards! Anything could happen, and we are just as in the dark as you are! Each contribution will follow on from the one before, so the authors only have a short amount of time to read the previous installment and write the next bit. It could be amazing, it could be a flop – but it will be entertaining! Make sure you follow the Escape blog and follow @escapepublisher on Twitter to follow the story, and visit the blog every day from Valentine’s Day onwards. My contribution will be posted on the 23rd Feb. I’m excited, and also a little scared! 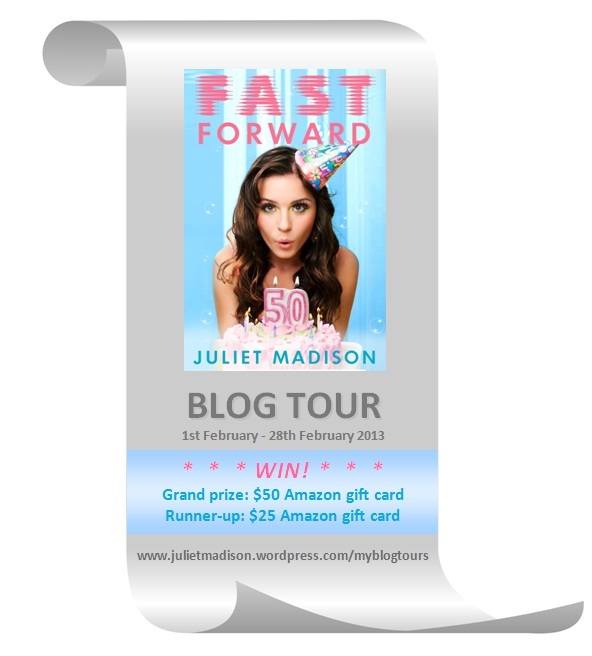 Posted on February 10, 2013, in Announcements, Competitions, General and tagged blog tour, escapade, escape publishing, fast forward, giveaway, interviews, Juliet's interviews. Bookmark the permalink. 2 Comments. The Escape plan sounds like lots of fun! Can’t wait! It’s going to be HEAPS of fun! I’ve had a sneak peek at the start but have no idea what’s going to happen from now on!